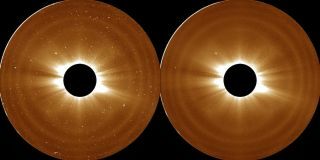 These observations, taken by NASA's Solar Terrestrial Relations Observatory, or STEREO on Aug. 5, 2007, helped scientists define the outer limit of the sun's atmosphere. The sun's volatile atmosphere is even bigger than expected, a NASA spacecraft revealed through observations of gigantic waves. While the sun itself is 864,938 miles (1.392 million kilometers) wide, NASA's Solar Terrestrial Relations Observatory, or STEREO, found that the solar atmosphere, known as the corona, stretches 5 million miles (8 million km) above the sun's surface. "We've tracked sound-like waves through the outer corona and used these to map the atmosphere," Craig DeForest of the Southwest Research Institute in Boulder, Colorado, said in a statement from NASA. "We can't hear the sounds directly through the vacuum of space, but with careful analysis we can see them rippling through the corona." These waves, called magnetosonic waves, are a cross between sound waves and magnetic waves called Alfven waves. They oscillate only about once every four hours and span 10 times the width of Earth, NASA officials said. When magnetosonic waves erupt from solar storms and other disturbances, they can ripple up to 5 million miles away from the sun's surface, DeForest and colleagues found. Beyond this boundary, solar material separates from the corona and flows out into space in a steady stream known as the solar wind. NASA officials say the findings will help researchers prepare for the space agency's Solar Probe Plus mission, scheduled to launch in 2018. That mission will send a spacecraft closer to the sun that any man-made object has ever ventured — within 4 million miles (6.4 million km) of the sun's surface. Now, scientists know the probe will actually be traveling through the corona during its historic trip. "This research provides confidence that Solar Probe Plus, as designed, will be exploring the inner solar magnetic system," Marco Velli, a Solar Probe Plus scientist at NASA's Jet Propulsion Laboratory in Pasadena, California, said in a statement. "The mission will directly measure the density, velocity and magnetic field of the solar material there, allowing us to understand how motion and heat in the corona and solar wind are generated." The findings, which were published last month in The Astrophysical Journal, should also help astronomers define the inner boundary of the heliosphere, the giant bubble enveloping the solar system, created by the solar wind and solar magnetic field.